IPL-DPC Acne therapy effectively treats those with mild and moderate inflammatory acne with a safe and reliable drug-free method, with no pain and no downtime. Visible blue light is used to produce free radicals in the sebaceous gland, which then destroys the bacteria in the acne lesions. A glowing appearance is produced through the reduction of common unsightly skin issues, such as age spots, sunspots, fine lines, large pores, dull skin and visible vessels, among several others. A great treatment for clients with multiple visible vessels (rosacea) and multiple pigmented lesions. SharpLight’s IPL-DPC therapies successfully treat a vast range of vascular and pigmented lesions, including telangiectasia, erythema, rosacea, broken capillaries, spider veins, dyschromia, solar lentigo, mottled pigmentation, melasma and poikiloderma, and are ideal for all skin types and all age groups. 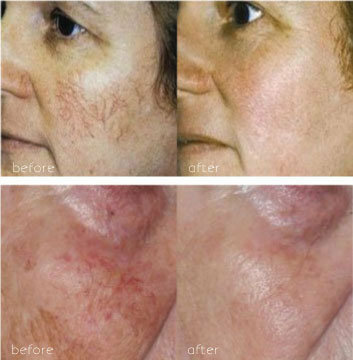 Pulsed light technology targets and applies light to the affected areas, which coagulates the blood vessel and breaks the pigmented lesion into tiny particles; these then disappear or rise to the surface of the skin as scabs, which are naturally exfoliated within one to two weeks. Pulsed light technology is a safe, effective and fast way to treat pigmented and vascular lesions and restore skin to a cleaner, clearer, younger looking texture – without down time. Get lasting hair reduction/removal with minimum discomfort in a relatively small number of treatment sessions. Using pulsed light or photoepilation, the hair reduction is achieved when the energy is transformed to heat in the active growth follicles, coagulating the follicle and limiting re-growth. The technologies’ high heat power delivers noticeable results in less time – and these results are targeted so as to protect the surrounding skin. Get the body you desire with SharpLight’s non-invasive face and body contouring laser treatments. Our advanced technologies dissolve cellulite, eliminate fat and tighten skin to produce visibly slimmer and shapelier forms and more youthful looking skin. These results are achieved in a relatively small number of short, pain-free treatment sessions that require no down time. Radio frequency waves target and increase the temperature of the fat cells in a specified area, which promotes the liberation and destruction of fat cells (lipolytic effect) and stimulates the increased production of collagen in the dermis, restoring the skins elasticity. Bipolar Radio Frequency increases local blood and lymphatic circulation and promotes the breakdown of fibrous tissue and the drainage of localized fatty deposits and cellulite cells. This treatment is a gentle and efficient procedure that reduces the range of photoaging signs and rejuvenates the skin, producing fresh, younger looking faces, necks and hands. These impressive results are achieved by replacing old, damaged cells with new, healthy ones. Our revolutionary Er:YAG laser produces a micro epidermal peel, which through a thermo-mechanical reaction, removes the problematic areas on the top layer of the skin. The fresh layer that grows has an improved texture, reduced or disappeared rhytids, wrinkles, scarring and spots and an overall renewed radiance. Defy time by reducing and, in many cases, eliminating the associated signs of aging, including loose or sagging skin, folds, creases and wrinkles, in a non-invasive and effective way. InfraRed targets damaged, problematic areas with energy and triggers the production of new, healthy collagen fibres beneath the surface. Through this natural healing process, skin’s elasticity, strength and appearance is restored and the skin, becomes tighter and smoother. The new collagen can last years, making the impressive results of these treatments long-lasting, cost-effective and very popular.